Last year marked the 75th anniversary of the Fair Labor Standards Act (FLSA), the legislation that established many of the basic labor protections workers enjoy today, such as a 40-hour workweek, overtime protection, and a national minimum wage. There have been periodic amendments to the FLSA over the years, but the 1966 amendments were especially significant. They extended protections to hotel, restaurant, and other service workers who had previously been excluded from the FLSA, but also introduced a new “subminimum wage” for workers who customarily and regularly receive tips.1 Unlike temporary subminimum wages (such as those for students, youths, and workers in training), the “tip credit” provision afforded to employers uniquely established a permanent sub-wage for tipped workers, under the assumption that these workers’ tips, when added to the sub-wage, would ensure that these workers’ hourly earnings were at least equal to the regular minimum wage. The creation of the tip credit—the difference, paid for by customers’ tips, between the regular minimum wage and the sub-wage for tipped workers—fundamentally changed the practice of tipping. Whereas tips had once been simply a token of gratitude from the served to the server, they became, at least in part, a subsidy from consumers to the employers of tipped workers. In other words, part of the employer wage bill is now paid by customers via their tips. Today, this two-tiered wage system continues to exist, yet the subsidy to employers provided by customers in restaurants, salons, casinos, and other businesses that employ tipped workers is larger than it has ever been. At the federal level, it currently stands at $5.12 per hour, as employers are required to pay their tipped staff a “tipped minimum wage” of only $2.13 per hour, and the federal regular minimum wage is currently $7.25.2 Remarkably, the federal tipped minimum wage has been stuck at $2.13 since 1991—a 23-year stretch, over which time inflation has lowered the purchasing power of the federal tipped minimum wage to its lowest point ever. Raising the wage floor for tipped workers is crucial for a number of reasons. Rising income inequality and the accompanying slowdown in improving American living standards over the past four decades has been driven by weak hourly wage growth, a problem that has been particularly acute for low-wage workers (Bivens et al. 2014). Tipped workers—whose wages typically fall in the bottom quartile of all U.S. wage earners, even after accounting for tips3—are a growing portion of the U.S. workforce. Employment in the full-service restaurant industry has grown over 85 percent since 1990, while overall private-sector employment grew by only 24 percent.4 In fact, today more than one in 10 U.S. workers is employed in the leisure and hospitality sector, making labor policies for these industries all the more central to defining typical American work life.5 Ensuring fair pay for tipped workers is also a women’s issue. Women comprise two out of every three tipped workers; of the food servers and bartenders who make up over half of the tipped workforce, roughly 70 percent are women. 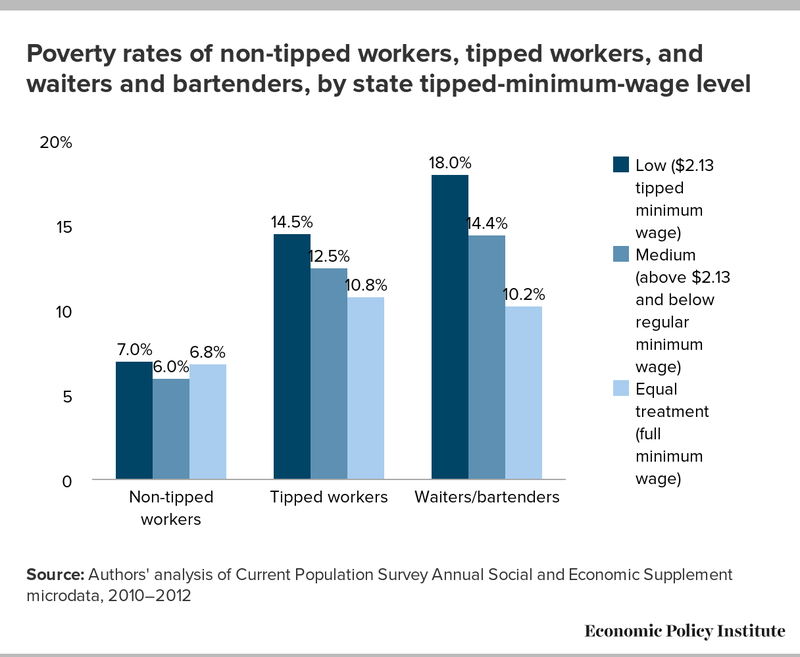 In their 2011 paper, Allegretto and Filion gave a historical account of the tipped-minimum-wage policy and brought much-needed attention to how the two-tiered wage system results in significantly different living standards for tipped versus non-tipped workers. For instance, tipped workers experience a poverty rate nearly twice that of other workers. The 2011 report, coupled with more recent publications from the White House (2014) and the Congressional Budget Office (2014), contradicts the notion that these workers’ tips provide adequate levels of income and reasonable economic security. Given recent policy interest in the minimum wage and greater attention to the lesser-known subminimum wage for tipped workers, this paper updates the 2011 report to reflect recent changes to state wage policies, and includes updated demographic and earnings profiles of tipped workers. We extend the 2011 analysis especially with regard to the family structure of tipped workers, noting important differences between men and women. We also provide new data on family income levels and participation in federal assistance programs among tipped workers, as well as measures of job quality in the food service industry. The subminimum wage for tipped workers has remained at $2.13 since 1991. In 1996, it was decoupled from the regular minimum wage, such that the tipped wage remained at $2.13 even as the regular minimum wage was increased. At that time, the tipped minimum wage was equal to 50 percent of the regular minimum wage; today it is only equal to a record low 29.4 percent of the regular federal minimum wage of $7.25. Customers’ tips pay the $5.12 difference between the federal tipped minimum wage and the federal regular minimum wage. Thus, customers provide a subsidy to employers of tipped workers worth more than twice the wage these employers are required to pay their tipped staff. The restaurant industry is an intense user of both minimum-wage and tipped-wage workers, with more than 60 percent of tipped workers employed in food service. The full-service restaurant sector has grown about 86 percent from 1990 to 2013, while overall growth in the private sector was up 24 percent—illustrating why it is increasingly important to raise wages for these workers. Tipped workers are predominantly women (66.6 percent) and disproportionately young; however, the majority are at least 25, and over one in four are at least 40 years of age. Tipped workers have a median wage (including tips) of $10.22, compared with $16.48 for all workers. Due to their low wages and higher poverty levels, about 46.0 percent of tipped workers and their families rely on public benefits, compared with 35.5 percent of non-tipped workers and their families. While it is a good thing that workers faced with challenging circumstances can turn to these programs for assistance, these programs were not designed to serve as a permanent wage subsidy or part of the business strategy for low-wage employers. Job quality, as measured by access to benefits, is far worse for tipped workers. Workers in the accommodation and food service industry—an industry with a high concentration of tipped workers—are offered paid leave (sick, holiday, and vacation leave), health insurance, and retirement benefits at rates far below those of private-sector workers overall. Paying tipped workers the regular minimum wage has had no discernable effect on leisure and hospitality employment growth in the seven states where tipped workers receive the full regular minimum wage. In fact, sector growth in these states has been stronger since 1995 than in the states where tipped workers are paid a subminimum wage. The 1966 amendments to the Fair Labor Standards Act (FLSA) provided for a 50 percent “tip credit” for employers of tipped workers, allowing tipped workers’ income from tips to count toward half the regular minimum hourly wage guaranteed to workers by the FLSA, with the newly established subminimum wage comprising the other half. The real (inflation-adjusted) value of the two wages is illustrated in Figure A. In real terms, both wages are lower today than in 1966. 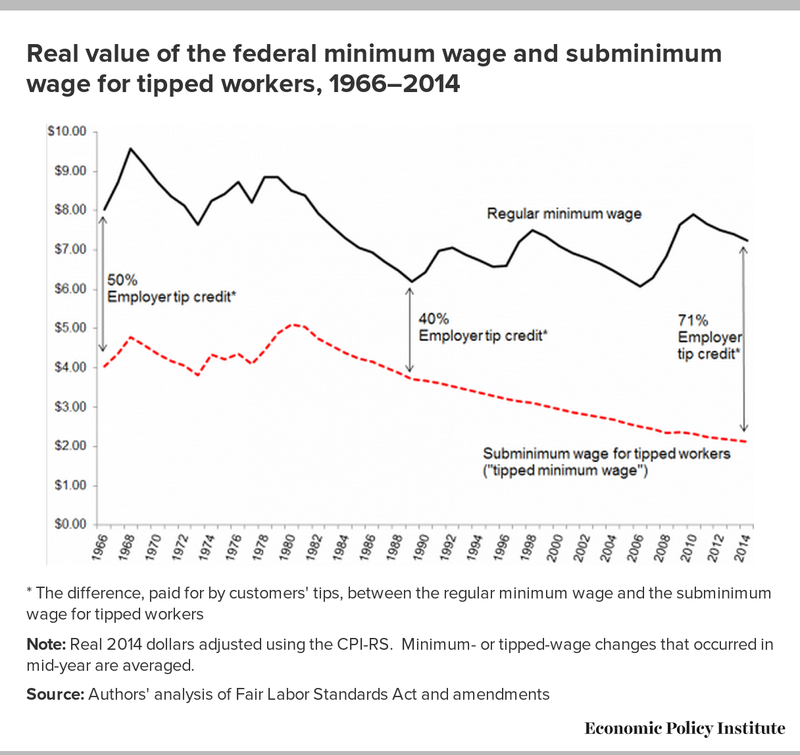 Over time, the federal tip credit provision—the difference, made up for by customers’ tips, between the regular minimum wage and the tipped minimum wage—dropped to as low as 40 percent (1980–1989) while never exceeding half of the regular minimum wage prior to 1996. The roughly proportional relationship between the two wages changed when President Clinton signed into law the Minimum Wage Increase Act of 1996. The act eliminated the FLSA provision that required the tipped minimum wage remain a certain percentage of the full minimum wage, instead locking in the tipped minimum wage at $2.13 per hour. At the time of the bill’s passage, the tip credit stood at 50 percent. In October of that year, as the bill’s regular minimum-wage increase from $4.25 to $4.75 took effect, the $2.13 tipped minimum wage remained frozen—bringing the tip credit for employers above 50 percent (Whittaker 2006). Note: Real 2014 dollars adjusted using the CPI-RS. Minimum- or tipped-wage changes that occurred in mid-year are averaged. 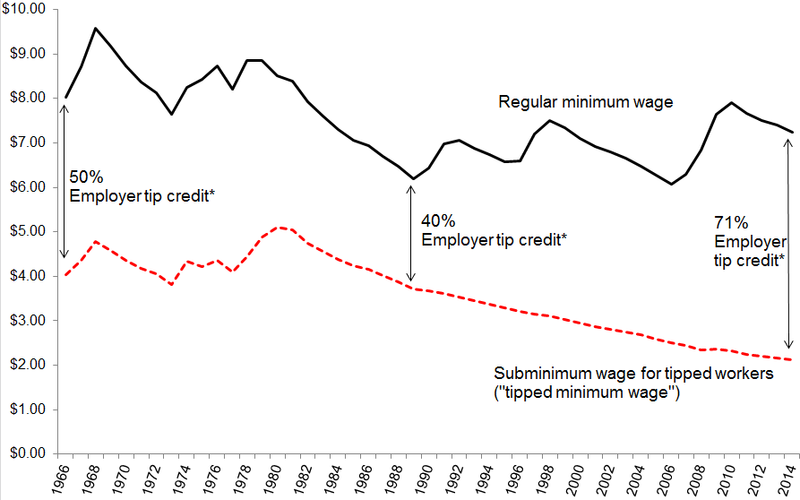 The change to the tip credit in 1996 effectively shifted responsibility for an increasing portion of tipped workers’ wages from employers to customers; it greatly reduced employers’ future wage bill by locking in a low base wage for tipped workers that would remain fixed, even as prices rose or the regular minimum wage was increased. Legally, employers of tipped workers are still required to ensure that the sum of tipped workers’ base wages plus their tips is equal to at least the full regular minimum wage; however, as is discussed later in detail, enforcement of this requirement is fraught with problems, and evidence suggests that tipped workers are subject to high rates of wage theft. The two-tiered wage system established under the 1966 amendments to the FLSA did not remain uniform across the country, as states have implemented an array of mixed rules for both the regular minimum wage and the subminimum wage for tipped workers that differ from federal policy.7 The map in Figure B depicts state regular minimum-wage levels and tipped-minimum-wage levels as of January 1, 2014 (a summary of these data is also presented in the top panel of Table 1, which is introduced in the following section). Of the 50 states plus the District of Columbia, 29 follow the federal regular minimum wage level of $7.25. The 21 states (plus the District of Columbia) with regular minimum wages above the federal $7.25 are denoted in the figure with hash marks. Note: This map depicts state wage levels as of January 1, 2014. We next examine states’ tipped wage policies. As noted previously, the difference between the tipped minimum wage and the regular minimum wage determines the allowable tip credit for employers in each state. In broad terms we refer to the level of tip credit in each state as full, partial, or no tip credit. 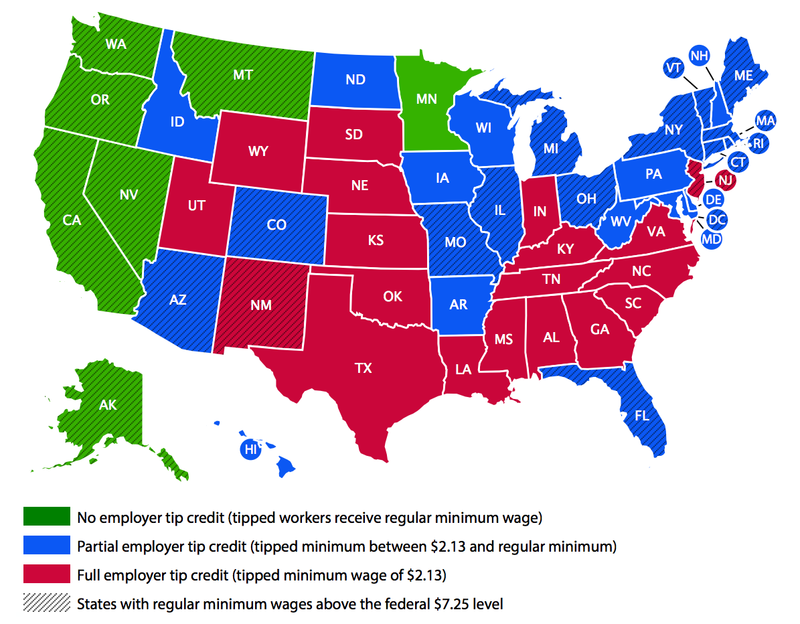 A full tip credit state (these 19 states are depicted in red on the map) follows the federal $2.13 subminimum wage for tipped workers and thus takes advantage of the maximum allowable tip credit. There are 31 states (plus the District of Columbia) with tipped minimum wages above the federal $2.13. These include partial tip credit and no tip credit states. A partial tip credit state sets a subminimum wage above $2.13 but below the binding regular minimum wage for that state. These 24 states, plus the District of Columbia, are depicted in blue. Of these, 11 follow the federal regular minimum wage rate, while 14 have higher regular minimum wages. The range of tipped wages (tip credits) varies considerably across the partial tip credit states, from a low of $2.23 ($5.02) in Delaware to a high of $7.00 (25 cents) in Hawaii. Seventeen states follow federal policy on both counts, while Minnesota is the only one that has a $7.25 regular minimum but does not allow for a subminimum wage. A complete list of state policies is included in Appendix Table A1. State minimum-wage scenarios are often changing given decades of federal inaction on the tipped wage and five years of federal inaction on the regular minimum wage. Thus far in 2014, 34 states have considered raising their wage floor, and eight have enacted increases (National Conference of State Legislatures 2014). Yet even as states adopt wage floors above the federal level, they often overlook tipped-wage policy. Indeed, recent minimum-wage increases in seven states plus the District of Columbia were mixed on tipped-minimum-wage policy. For instance, as just noted, Minnesota does not allow for a subminimum wage; thus, tipped workers there will receive the full regular minimum wage when it increases to $9.50 in 2016. Hawaii’s regular minimum wage will increase to $10.10 by 2018, and the state also eliminated the previous 25-cent tip credit for employers, although a 75-cent tip credit exception will be allowable in instances where tipped workers earn at least $17.10 per hour after tips. In contrast, Maryland increased its state minimum to $10.10 earlier this year, but kept its subminimum wage frozen at $3.63, where it has remained since 2009. Similarly, the minimum wage in the District of Columbia is set to rise to $11.50 by 2017, but the District’s tipped minimum wage will remain fixed at $2.77. Even if the federal government does not move on the tipped minimum wage, the increasing potential for state action makes it important to understand more about this policy, the population it affects, and the potential effects any policy changes would have. Interestingly, the variation in minimum-wage and tipped-wage policies depicted in the map constitutes a natural experiment of sorts. The restaurant industry is an intense user of both minimum-wage and tipped-wage workers, with more than 60 percent of tipped workers employed in food service. The industry has fought hard to keep the federal $2.13 floor in place over the last two decades, arguing that raising the tipped wage would be severely damaging to the industry and its workers. But restaurants exist in every state and under all the various minimum- and subminimum-wage policies depicted in the map. Moreover, Allegretto (2013) finds that increases in the tipped minimum wage over the last several decades had little to no effect on employment—specifically, employment effects are “small and not distinguished from zero.” Allegretto (2013) finds that implementing a policy similar to the Harkin-Miller proposal would have very little effect on restaurant employment while boosting overall earnings for both tipped and minimum-wage workers in full-service restaurants. To examine the demographic characteristics of workers who would be affected by increasing the tipped minimum wage, we use the 2011–2013 Current Population Surveys (CPS) to identify workers and tipped workers, as well as a subset of wait staff and bartenders. The three survey years are combined to produce a sufficient sampling of tipped workers. While there is no data set that explicitly identifies tipped workers, we define our sample as best we can by using several variables available in the CPS.9 Workers are included in the sample if they are at least 16 years old, employed but not self-employed, and report positive wage income. Tipped workers in our sample include those workers in occupations that are predominantly tipped, such as waiters and waitresses, bartenders, gaming service workers, barbers, hairdressers, and other personal appearance workers (see Appendix Table A2 for details). 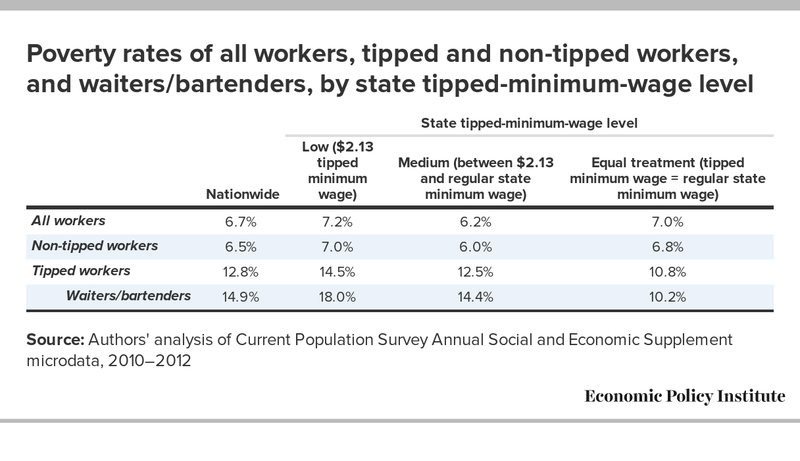 This section first examines the number of tipped workers and their distribution among the state tipped-wage categories. It then examines the gender, age, education, and family characteristics of these workers. The middle part of Table 1 provides the distribution of our sample of all workers, tipped workers, and a subsample of waiters and bartenders. We single out waiters and bartenders because most are tipped workers and because they comprise the bulk (58 percent) of the tipped workforce. 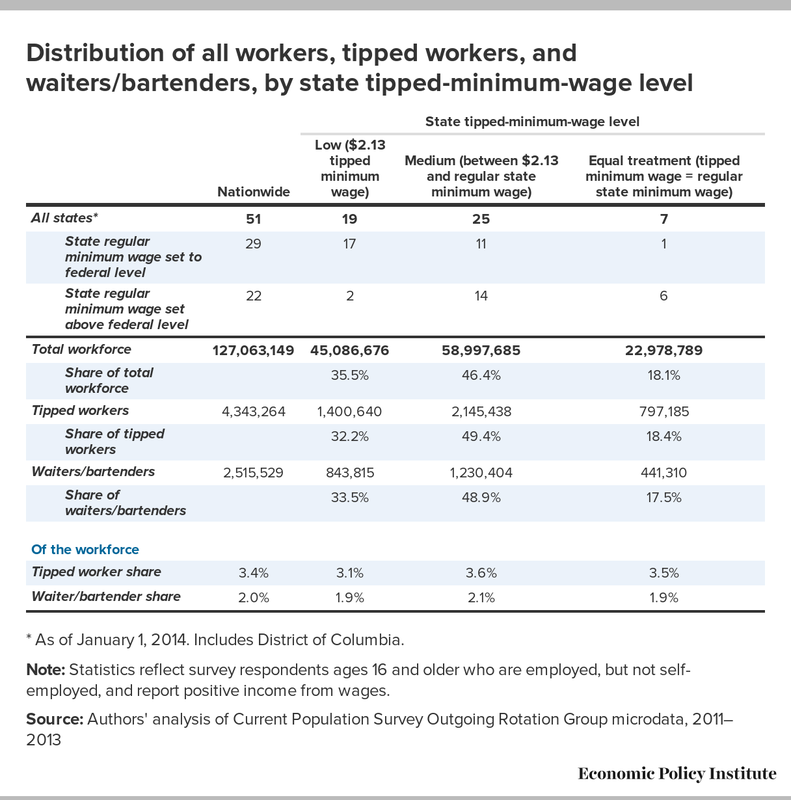 There are approximately 4.3 million tipped workers in the United States, and roughly 2.5 million are waiters and bartenders.10 A plurality of workers, including tipped workers, reside in partial tip credit states that set tipped wages above $2.13 but below the binding state regular minimum wage—46.4 percent of the overall workforce and 49.4 percent of tipped workers reside in these states. Approximately one-third of all tipped workers reside in states with a $2.13 tipped wage rate, and less than one-fifth (18.4 percent) are in “equal treatment” states that do not allow for a tipped or subminimum wage. * As of January 1, 2014. Includes District of Columbia. Note: Statistics reflect survey respondents ages 16 and older who are employed, but not self-employed, and report positive income from wages. The bottom panel of Table 1 shows the tipped worker and waiter/bartender shares of employment, overall and in each of the state tipped wage categories. Tipped workers and waiters/bartenders represent 3.4 percent and 2.0 percent, respectively, of the overall U.S. workforce. Looking across the state tipped wage categories, tipped workers comprise 3.1 percent of the workforce in states with a $2.13 subminimum wage, 3.6 percent of the workforce in partial tip credit states, and 3.5 percent of the workforce in states with no subminimum wage. 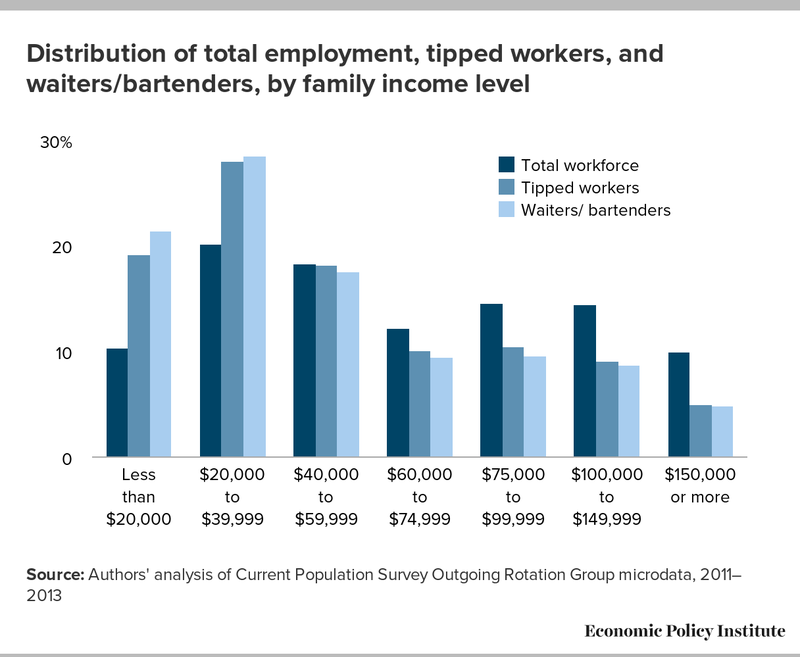 There are no significant differences in waiters’ and bartenders’ share of overall employment across the tipped wage scenarios. These results suggest that tipped work opportunities are not diminished in states that do not allow for a subminimum wage. We interact with tipped workers on a regular basis, from our favorite bartender at the local pub to those who serve us at the restaurants we frequent. But, by and large, tipped workers are not representative of the overall workforce. 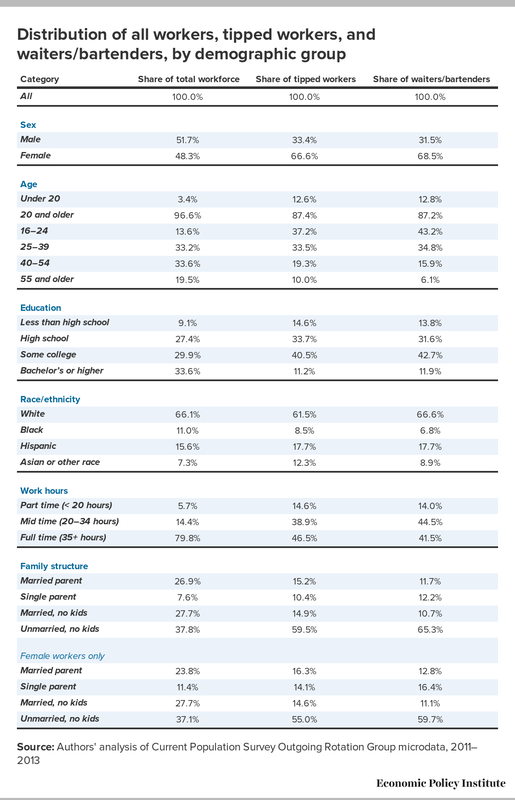 As Table 2 shows, tipped workers are overwhelmingly (two-thirds) female, younger, and tend to have lower levels of education than the overall workforce. Still, although tipped workers are younger than the overall workforce, they are not mainly teenagers, as is often thought. In fact, as shown in Figure C, only a small share of tipped workers are teens (12.6 percent). 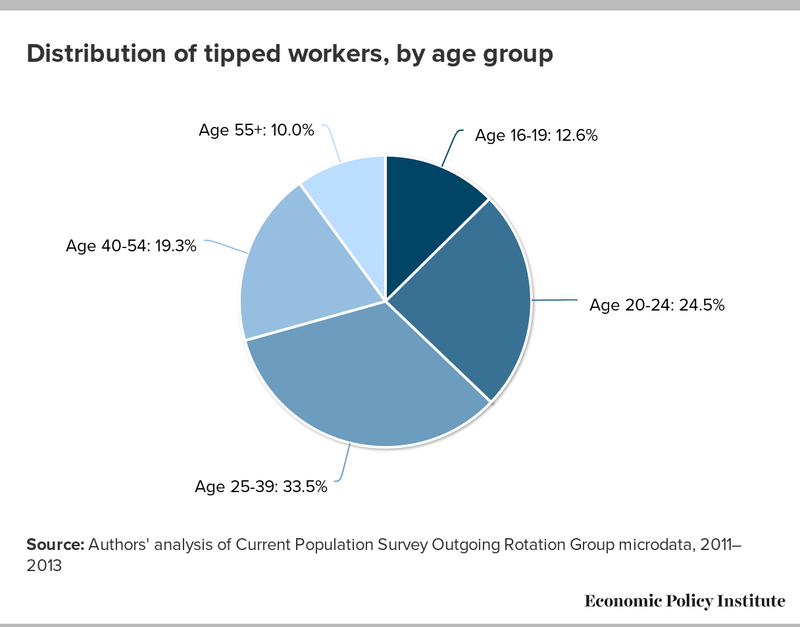 Furthermore, about a quarter of tipped workers are young adults, ages 20 to 24, while the vast majority (62.8 percent) are at least 25 years old. Nearly 30 percent are at least 40 years old. Tipped workers have lower levels of education than the overall workforce, as 36.5 percent of all workers lack more than a high school education, compared with around 48.2 percent of tipped workers and 45.4 percent of waiters/bartenders. However, more than half of all tipped workers and waiters/bartenders have at least some college experience. Tipped workers, especially waiters/bartenders, are less likely to be black, as they are underrepresented in this line of work as compared with their representation in the overall workforce. Tipped workers are also less likely to work full time; while this may be at the behest of some of these workers, it is also the case that many workers desire more hours and are unable to receive them. The bottom of Table 2 details workers’ family dynamics. Approximately 35 percent of all U.S. workers are parents. Among tipped workers the corresponding figure is 25.6 percent, yet that figure rises to 30.4 percent if we only look at women, who are the majority of the tipped workforce. Similarly, 29.2 percent of women wait staff and bartenders are parents, and more than half of these parents are single parents. There are two common misconceptions of tipped workers’ pay. First, many people are simply unaware of the low base wage that employers actually pay tipped workers, and second, they believe these service workers make a large amount of “extra” money in tips. As already discussed, for most tipped workers, a significant portion of their tip income compensates for their receiving a low subminimum base wage from their employer. More importantly, the data belie the notion that most of these workers make substantial tipped income. Table 3 reports median wages—that is, the wage of the worker right in the middle of the distribution—for all workers, tipped workers, and waiters/bartenders. The wage of a typical U.S. worker is about $16.48; females make less than males ($15.09 versus $18.13); workers under 20 earn less than older workers ($8.27 versus $16.98); and the least-educated make less than those with the most education ($9.98 for those with less than a high school degree, versus $25.91 for those with at least a bachelor’s degree). Note: Wage values reflect both base wages and tips. Figures are in 2013 dollars adjusted using the CPI-U-RS. Regardless of demographic category, the median tipped worker and waiter/bartender earns less than the median U.S. worker. Compared with the $16.48 median wage of all workers, tipped workers have a median wage (including tips11) of $10.22; waiters/bartenders make slightly less ($10.11). Even as women represent two-thirds of tipped workers, they still make less than their male counterparts ($10.07 for women at the median versus $10.63 for men). The respective figures are $9.89 and $10.71 for waiters and bartenders. For the most part, tipped work is low-wage work. 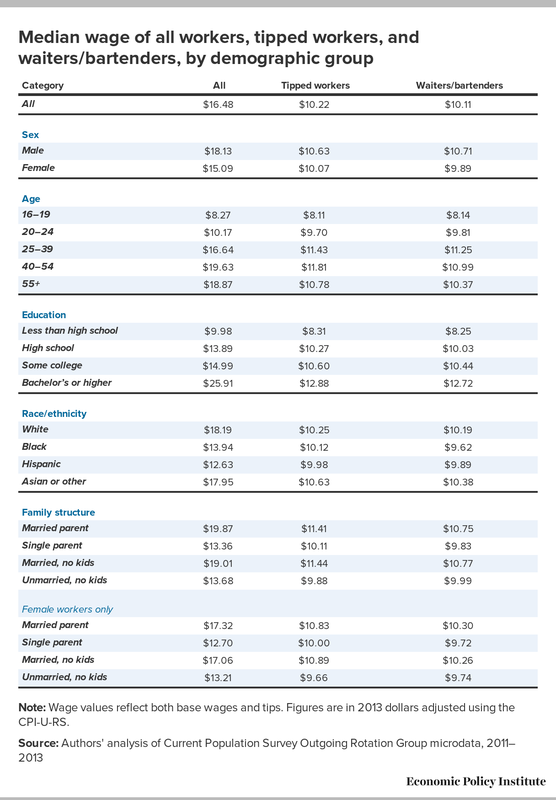 Hourly pay across all the demographic categories in Table 3 varies from a low of $8.11 to a high of $12.88. The median wages of tipped workers who are also parents are $10.11 and $11.41 for single and married parents, respectively. The wages of the nearly one-in-three female tipped workers who are also parents are even lower, at $10.00 and $10.83 for single and married parents, respectively. The low wages of tipped workers derive, in part, from the lower base wage or tipped wage provided by employers. 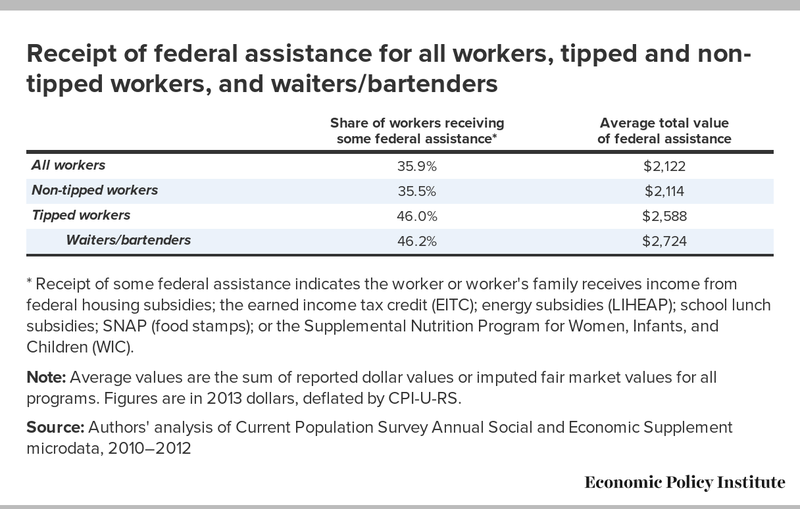 As the data show in Table 4, the tip credit allowance—the amount of tips an employer can use as credit toward a worker’s wage—matters. Across the three broad tip credit policies, there are measurable differences in wages: There is a progression of increasing median wages from the low to higher tipped-wage states both for tipped workers and all workers. This likely also reflects other policies besides tipped-wage floors that would affect wages more broadly. For example, low tipped-wage states are more likely to have low regular state minimum wages, while high tipped-wage states are more likely to have high regular state minimum wages. 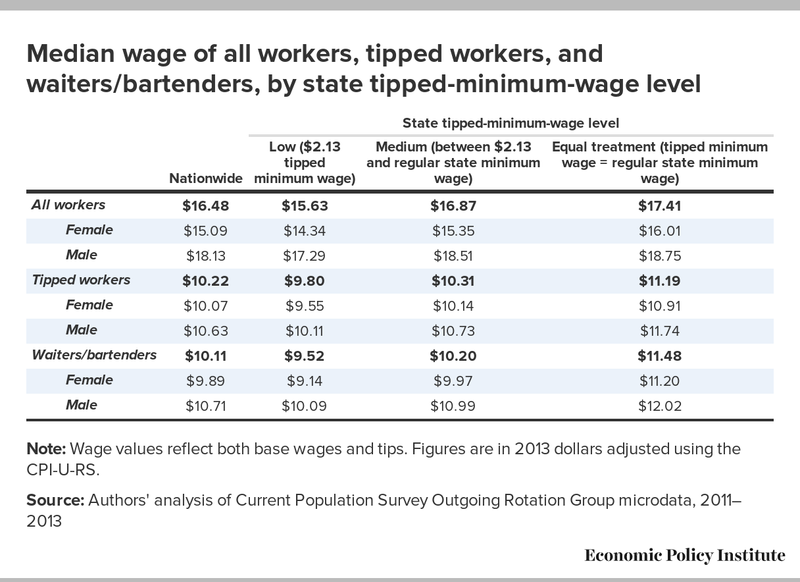 Still, the relative gains from low to high tipped-wage states are greater for tipped workers, especially waiters/bartenders, compared with the gains of the general workforce—even though tipped workers earn less in each case. For example, tipped workers in equal treatment states earn 14.2 percent more than tipped workers in low tipped minimum states, compared with an 11.4 percent gain for all workers (the relative difference is 20.6 percent for waiters/bartenders). Looking more closely at the gains for waiters and bartenders, we see that total wages of women are 22.5 percent higher, and of men 19.1 percent higher, in states that do not allow for a subminimum wage compared with the states that follow the $2.13 policy. Restaurant industry advocates often argue that raising or eliminating the tipped minimum wage would leave tipped workers worse off because customers would disproportionately reduce tips if they knew employers were paying higher base wages. These data show that the evidence for this claim is weak, and even if it were true, tipped workers in equal treatment states still earn higher total wages (tips plus base wage) than workers in states with lower tipped minimum wages. The family structure data reported in Table 2 showed that while tipped workers are less likely to be married and have children compared with the overall workforce, they are more likely to be single parents—especially female workers. As that table shows, of tipped workers who are women, 30.4 percent are parents, and 14.1 percent are single parents. Among wait staff and bartenders who are women, 16.4 percent are single parents. Low wages combined with lower marriage rates translate into low family incomes for most tipped workers. The distribution of tipped workers, waiters and bartenders, and the total workforce across family income levels is reported in Figure D. About 30.5 percent of all U.S. workers are in families that earn less than $40,000. That share jumps to 47.2 percent for tipped workers and 49.9 percent for waiters and bartenders. Looking only at women (gender-specific breakdowns are not displayed in the figure), the trends are similar, if not slightly more pronounced: 31.7 percent of all working women are in families with total incomes below $40,000, compared with 47.6 percent of tipped workers who are women. Among female wait staff and bartenders, over half (51.8 percent) fall into this low-income group. The relatively low family incomes of tipped workers mean they also experience poverty at much higher rates than other workers. As shown in Table 5, the poverty rate of non-tipped workers is 6.5 percent, while it is 12.8 percent for tipped workers in general and 14.9 percent for waiters and bartenders. While the magnitude of this difference by itself is startling, it is important to note how poverty rates for tipped workers vary significantly based on states’ tipped-minimum-wage policies. As depicted in Figure E, poverty rates for non-tipped workers do not vary much by state tipped-wage policies. Yet for tipped workers, and particularly for waiters and bartenders, the correlation between low tipped wages and high poverty rates is dramatic. Among wait staff and bartenders, 18.0 percent are in poverty in states that follow the $2.13 subminimum wage, compared with 14.4 percent in medium-tipped-wage states and 10.2 percent in equal treatment states that do not allow for a lesser tipped minimum wage. This pattern strongly suggests that higher tipped wages mitigate poverty to some extent, yet it is still the case that poverty among tipped workers is far too high even in states that do not allow for a subminimum wage. * Receipt of some federal assistance indicates the worker or worker's family receives income from federal housing subsidies; the earned income tax credit (EITC); energy subsidies (LIHEAP); school lunch subsidies; SNAP (food stamps); or the Supplemental Nutrition Program for Women, Infants, and Children (WIC). Note: Average values are the sum of reported dollar values or imputed fair market values for all programs. Figures are in 2013 dollars, deflated by CPI-U-RS. We have shown thus far that tipped workers are subject to low pay, low levels of total family income, and a greater likelihood of being in poverty. 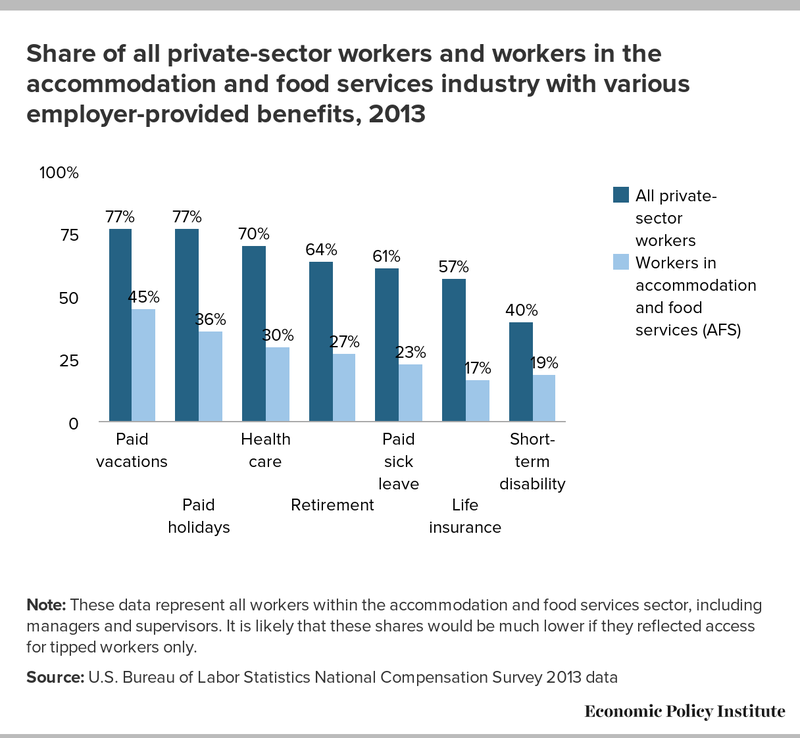 It is also the case that tipped workers are much less likely to have workplace benefits, as shown in Figure F. The Bureau of Labor Statistics National Compensation Survey (NCS) reports benefits for all private-sector workers and benefits by various establishment and worker characteristics, including a breakout for “accommodation and food services (AFS)”—a sector with the majority of tipped workers.14 The NCS reports that two of the most common benefits offered to workers are paid vacations and paid holidays—each offered to 77.0 percent of private-sector workers. But among workers in accommodation and food services, just 45.0 percent and 36.0 percent are offered paid vacations and paid holidays, respectively—and these figures are for all workers in that industry, including managers and supervisors. Note: These data represent all workers within the accommodation and food services sector, including managers and supervisors. It is likely that these shares would be much lower if they reflected access for tipped workers only. Health care and retirement benefits are crucial to most workers, but they are offered to just a fraction of AFS workers—30.0 percent and 27.0 percent, respectively, compared with 70.0 percent and 64.0 percent, respectively, of other private-sector workers. Given that the majority of tipped workers are wait staff and bartenders who handle food and drink, it is particularly unfortunate—and potentially dangerous—that their industry does not provide widespread access to paid sick leave; just 23.0 percent of AFS workers receive paid sick leave, compared with 61.0 percent of the total private-sector workforce. As we’ve shown, many tipped workers are parents—many single parents—with low family incomes; thus, life insurance and short-term disability protection would be particularly important to these workers and their families, especially given the physical nature of their work. Life insurance and short-term disability protection are offered to 57.0 percent and 40.0 percent of private-sector workers, yet only 17.0 percent and 19.0 percent, respectively, of AFS workers. Tipped workers face a number of other unique challenges in the workplace. As mentioned earlier, in states that allow for a subminimum wage, a tipped worker’s tips plus her base or tipped wage must equal at least the regular state minimum wage—if not, her employer must make up the difference. However, tipped workers are often unaware that their tips and base wage must sum to at least the regular minimum wage. This regulation is hard to implement in practice, both because it is logistically difficult to do so and because it is up to the worker to request that her employer make up the difference. To determine compliance with the FLSA’s wage requirements, the total of tips plus the subminimum base wage is to be assessed on a workweek basis.16 A workweek is defined as any fixed and regularly recurring 168-hour period. But many tipped workers work irregular schedules, and the practical implementation of this regulation is unclear; at what point does an employer stop the clock to tally up hours, tips, and base wages? Compliance is difficult to assess even if a good-faith employer would like to do so. Moreover, a tipped employee seeking to monitor her employer’s compliance with the law would need to record her hours for the determined workweek—erratic schedules notwithstanding—record all tips she receives (how employees should treat tips shared with other staff, such as restaurant bussers or bar-backs, in this calculation is also unclear), record the base wage she was paid from her employer, and calculate if the effective hourly rate equaled the required state or federal minimum wage. If it did not, this employee would have to approach her employer seeking the missing pay. Of course, this is the same employer who determines whether this employee will be given the most lucrative shifts, the best restaurant sections (in the case of waiters and waitresses), or if the employee will retain her job at all. It is unrealistic to think that a tipped employee dealing with an unscrupulous employer would be able to reclaim her lost wages, let alone confront someone with such power over her near-term financial health. Research has also shown that the practice of tipping is often discriminatory, with white service workers receiving larger tips than black service workers for the same quality of service (Lynn et al. 2008). The worker advocacy group Restaurant Opportunities Centers (ROC) United has published numerous testimonies from both tipped and non-tipped workers in the restaurant industry that anecdotally describe these problems. ROCs “Behind the Kitchen Door” worker survey reports echo what is found in much of the data presented here: Workers report an array of problems, from low earnings and low to no benefits, to overtime violations, working off the clock, and issues of safety (ROC various years; Jayaraman 2013). Should we have a tipped minimum wage? The results obtained here are informative for policy. The Harkin–Miller minimum-wage bill proposes to increase the regular federal minimum wage from $7.25 to $10.10 in three 95-cent steps. The bill would also reconnect the severed historical link between the tipped and the regular minimum wages by raising the former to 70 percent of the latter over six years. This would certainly improve the situation for tipped workers, adding greater stability to their income and boosting their total pay. Contrary to claims from industry advocates, research has shown that increasing the tipped minimum wage would boost earnings for tipped-wage workers without unduly harming employment, particularly full-service restaurant employment (Allegretto 2013). This report explored the history and rationale for the subminimum wage earned by workers who receive tips for their services. The federal tipped minimum wage was originally set at 50 percent of the regular minimum wage. Today, the subminimum wage for tipped workers is a mere $2.13 an hour, where it has been for 23 years. Over that time, its value has eroded to just 29.4 percent of the regular minimum wage that applies to non-tipped workers. 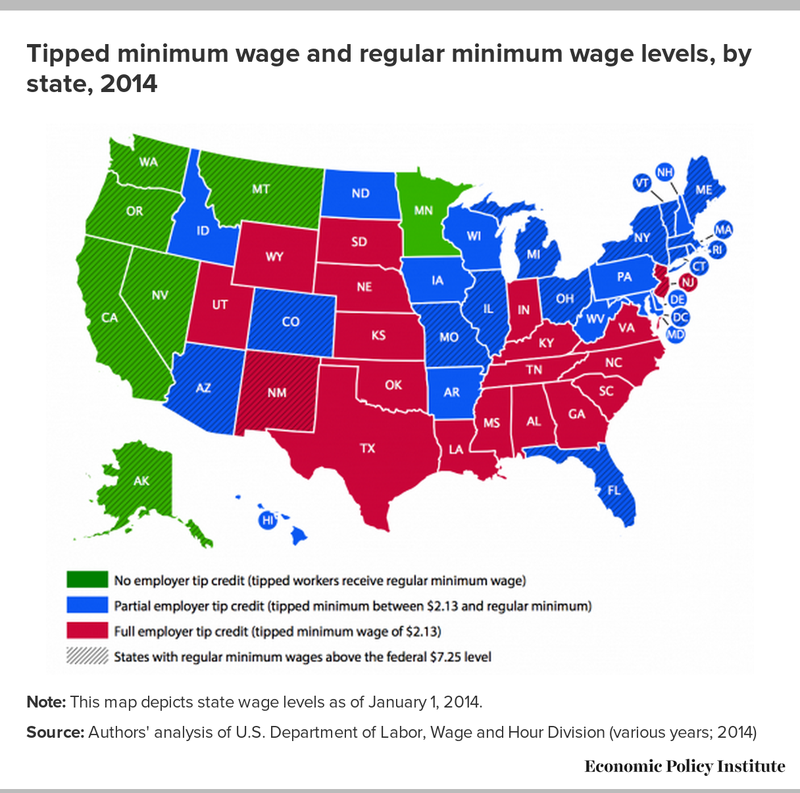 Still, many states have enacted tipped minimum wages above $2.13. This report shows that tipped workers receive higher total wages and have lower levels of poverty in states where the tipped minimum wage is relatively high. Often, discussion and action surrounding the minimum wage ignores or excludes tipped workers and the subminimum wage they receive. Yet this is a growing occupational sector, and effective policy could transform the low-wage, high-poverty jobs in the sector into better quality jobs. Much of tipped employment is the epitome of “just-in-time” employment—adjusting staffing levels on an immediate basis in response to customer flows. While this may be good for the employer, it is far less beneficial for workers because it can produce highly unpredictable work hours, and thus highly unpredictable pay. Wage volatility is further exacerbated by workers’ reliance on tips from customers, which also vary considerably. A tipped worker’s paycheck can vary wildly depending on the fluctuations of customer tips and assigned shifts, making it difficult for tipped workers to budget, or make investments that require more stable and predictable income levels—such as buying a home or a car, or seeking further education. In real terms, the U.S. minimum and subminimum wage floors have long been in decline, exacerbating the general stagnation or decline of wages for the vast majority of American workers, particularly low-wage workers. Even the broader world is taking notice, as the International Monetary Fund (2014) recently recommended that the U.S. minimum wage be increased, given its current low level (compared both with its historical values and international standards). The Organization for Economic Cooperation and Development (2014) has also recommended an increase in the U.S. minimum wage as a measure to improve job quality and workers’ well-being. Reports from the Congressional Budget Office (2014) as well as research from academia (Dube 2013) conclude that raising the wage floor would lift hundreds of thousands, if not millions, out of poverty. For all these reasons, it is perhaps no surprise that polling consistently shows that most Americans (73 percent) would like to see a minimum-wage hike (Pew Research Center 2014). To the best of our knowledge, there has not been a poll conducted specifically on changing the $2.13 tipped wage, but in all likelihood, this is simply another indication of the lack of public awareness on this issue. We cannot help but wonder whether, if more Americans knew the exceptionally low base wages being paid to tipped workers, they might prefer these employers pay tipped workers a higher base wage, and let tips once again be simply an expression of gratitude for good service. We suspect most would agree that the consumer subsidy to these employers has grown for too long. It is certainly time to raise both wage floors, but given the dramatic differences in living standards for tipped versus non-tipped workers, we question whether there should be a two-tiered wage system at all. Tipped workers in the seven “equal treatment” states appear to be noticeably better off than their counterparts in the rest of the country, receiving higher total wages and experiencing poverty at significantly lower rates. At the same time, industries that employ tipped workers in these states are thriving. Raising the tipped minimum wage up to a higher percentage of the regular minimum wage would be a step in the right direction, but perhaps we should simply eliminate the tipped minimum wage altogether, and give tipped workers the same basic protection afforded to other workers. — The Economic Policy Institute gratefully acknowledges the generous support it received from the Ford Foundation for this project. Sylvia A. Allegretto, Ph.D. is an economist and co-director of the Center on Wage and Employment Dynamics at the Institute for Research on Labor and Employment at the University of California, Berkeley. She is also a research associate of the Economic Policy Institute and is co-author of many EPI publications, including past editions of The State of Working America, How Does Teacher Pay Compare?, and The Teaching Penalty: Teacher Pay Losing Ground. The Center on Wage and Employment Dynamics is a center at the Institute for Research on Labor and Employment at the University of California, Berkeley. CWED was established in 2007 to provide a focus for research projects on wage and employment dynamics in contemporary labor markets. Current research topics include minimum wage impacts, tipped worker labor markets, transformation of retail labor markets, health insurance and health policy, immigration, worker turnover and job training, labor relations and productivity, and models of low-wage labor markets. The Economic Policy Institute is a nonprofit, nonpartisan think tank that seeks to broaden the public debate about strategies to achieve a prosperous and fair economy. EPI stresses real-world analysis and a concern for the living standards of working people, and it makes its findings accessible to the general public, the media, and policymakers through books, studies, and popular education materials. Appendix Table A1 shows each state’s minimum-wage and tipped-minimum-wage level, as of January 1, 2014. * Connecticut has a higher $7.34 tipped minimum wage for bartenders only. ** New York has a tipped minimum wage of $5.00 for "food service workers" and $5.65 for "service employees." Note: For states that do not have a state minimum wage or a minimum wage that is less than the federal minimum, we report the federal standards because most workers in these states are legally required to be paid the federal rate. The Current Population Survey does not explicitly identify tipped workers. Rather, there is a variable that indicates workers who regularly receive tips, overtime, or commissions. In order to identify workers who are likely to be tipped, we first looked at all occupations that had a high share receiving tips, overtime, or commissions. From this group, we selected those occupations that were most likely to receive tips, as shown in Appendix Table A2. Note: The tipped occupations listed here, and used in this report, are the same as those used in CBO (2014). 1. Legislation originally enacted in 1966 required that a worker had to customarily and regularly earn at least $20 a month in tips for their employers to qualify for the tip credit. This was raised to $30 a month in 1978. Adjusted for inflation, that $20 minimum would now be about $146.34 per month. 2. If a tipped employee’s tips plus her base wage do not sum to at least the full minimum wage in any two-week period, the tipped worker’s employer is required to make up the difference through a higher base wage; however, as explained in later sections, this intended safeguard is fraught with problems. 6. For more historical information, see Allegretto and Filion (2011). 7. The scenarios are always changing as federal and/or state wage polices are adopted; the map depicts the wage policies as of January 1, 2014. Some states have already legislated both regular and tipped-minimum-wage increases that will occur over the next several years. 8. There are variations within state policy. For example, Nevada, a no tip credit state, has a wage floor of $7.25 for workers with or $8.25 without employer-provided health insurance. 9. It is important to keep in mind that not all tipped workers have been identified because the Current Population Survey does not have a unique identifier for such a distinction. The CPS includes a variable that identifies persons who usually receive “overtime pay, tips or commissions.” Likely tipped workers were identified using this variable along with additional analysis. There are other workers, especially in the restaurant industry or food service occupations (such as bussers, delivery workers, and runners) who may also be tipped workers—even though their tips may come indirectly from wait staff, instead of directly from customers. 10. In Allegretto and Filion (2011), we included slightly fewer occupational categories as predominantly tipped occupations. 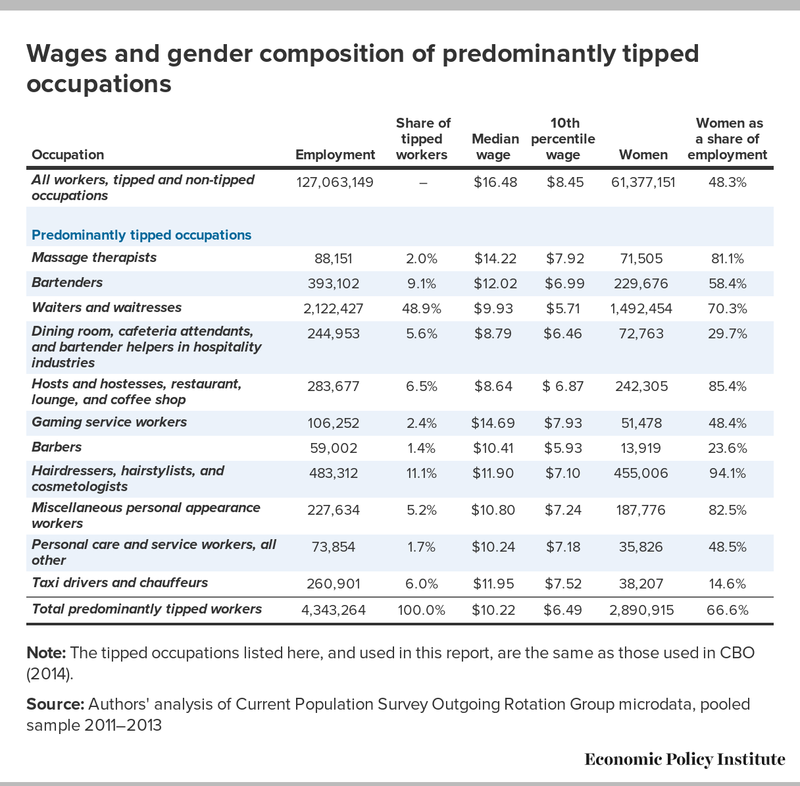 White House (2014) uses this slightly smaller set of predominantly tipped occupations as well; however, CBO (2014) employs the broader set of tipped occupations listed in Appendix Table A2. We analyzed demographic characteristics, wage rates, poverty rates, and public transfer receipt rates between the two sets of predominantly tipped occupations and found that they were not substantially different, and thus opted to use the set of occupations consistent with the CBO’s definition of tipped workers. 11. All wage values in this report reflect total wages, i.e., base wages plus tips. 12. In 2013, the 30th percentile wage for U.S. workers was $12.00, according to data from the Current Population Survey. 13. These findings are similar to those in Fast Food, Poverty Wages by Allegretto et al. (2013a). In that paper, it was estimated that 25 percent of working families rely on public benefits (Medicaid, Children’s Health Insurance Program [CHIP], federal EITC, SNAP, and Temporary Assistance for Needy Families [TANF]), while the share rises considerably to 52 percent among fast-food workers and their families. That study was restricted to workers who worked at least 27 weeks per year and at least 10 hours per week. Using the same data and methodology from the fast-food worker study, we estimate that 40 percent of tipped workers and their families, and 42 percent of waiters/bartenders and their families, receive public benefits to make ends meet—again compared with 24 percent of working families in general. 14. The industry sector of accommodation and food services captures many tipped workers but also non-tipped workers and staff such as managers who are likely to have higher wages and benefits. These data are from an unpublished NCS report on 2013 benefits (forthcoming in 2014). 15. We requested figures from the BLS for tipped workers and/or wait staff from the NCS, but sample sizes were too small for these populations by themselves. 16. See, e.g., 29 U.S.C. 206(a) in the FLSA (http://bit.ly/1qoLKwH). 19. We do not mean to imply any sort of causal relationship here, and looking at changes in specific industries within the leisure and hospitality sector or over different timeframes might yield different results. There are undoubtedly other factors correlated with state tipped-wage policies influencing employment growth between these groups of states. A more precise inquiry into the relationship between tipped-wage policies and employment that controls for these factors is beyond the scope of this paper. However, Allegretto (2014) examines this specific question with an appropriate set of controls and finds no significant effect on employment from higher tipped minimum wages. The relevant point here is that if paying the regular minimum wage to tipped workers were significantly harmful to these industries, we would expect these harmful effects to be readily apparent—and they are not. 20. For more information, see ROC United (2014). Bureau of Labor Statistics. 2014 [forthcoming]. National Compensation Survey: Employee Benefits in the United States. Unpublished data forthcoming summer 2014. Jayaraman, Saru, and Eric Schlosser. 2013. Behind the Kitchen Door. Ithaca, N.Y.: ILR Press. National Restaurant Association. 2014. 2014 Restaurant Industry Forecast. Restaurant Opportunities Centers (ROC) United. Various years. http://rocunited.org/research-resources/our-reports/. Whittaker, William G. 2006. The Tip Credit Provisions of the Fair Labor Standards Act. Congressional Research Service Report for Congress.